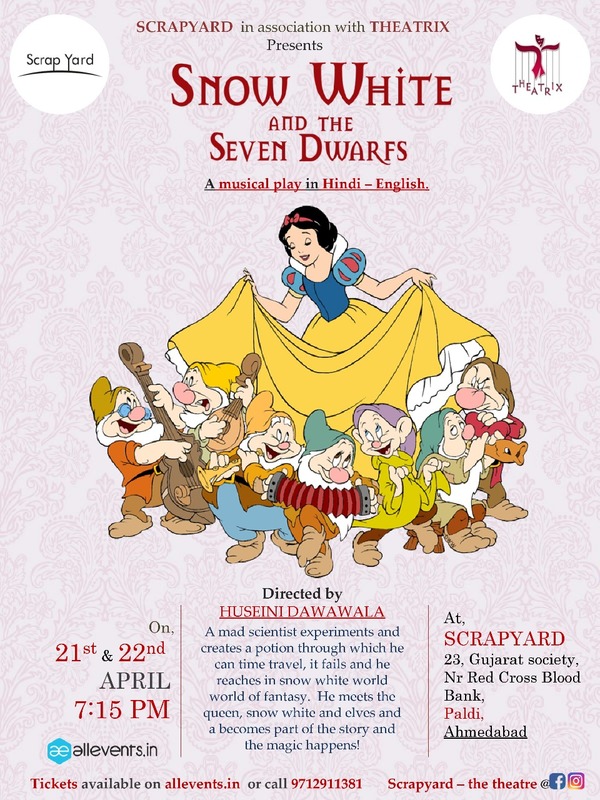 Scrapyard – The Theatre in association with Theatrix ENTERTAINMENT (Mumbai) presents. A Musical play in Hindi – English for children. A MAD SCIENTIST EXPERIMENTS AND CREATES A POTION THROUGH WHICH HE CAN TIME TRAVEL, IT FAILS AND HE REACHES IN THE SNOW WHITE WORLD, A WORLD OF FANTASY. THE MAD SCIENTIST MEETS THE QUEEN, SNOW WHITE AND ELVES. HE BECOMES PART OF THE STORY AND SAVES SNOW WHITE FROM THE QUEEN.